The 2018 season was Justin Haley’s first full season in the NASCAR Camping World Truck Series driving the No. 24 GMS Racing Chevy. And, what a season it has been for the Indiana native. Haley placed the second GMS truck in the championship race giving the team a 50 percent of winning the championship. Unlike Moffitt, Haley does have one start at Homestead that came last year, where he finished ninth for Maury Gallagher. It’s been a solid season for the 24 GMS Racing team who has been consistent all season. Let’s take a look at how Haley got here. How Haley Got Here – Haley came out with a bang with a second place finish giving GMS a one-two finish at Daytona. He continued to be consistent with top five and top 10 finishes. Haley’s breakthrough came with his first win at Gateway Motorsports Park in the summer. The team continued to stay strong before the Playoffs began. When the Playoffs began at Mosport, Haley won with last lap controversy between Kyle Busch Motorsports teammates that saw Haley in the right spot at the right time to collect win number two. He continued to have finishes of third at Las Vegas, fourth at Talladega, and sixth at Martinsville. 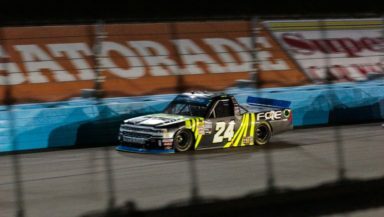 Haley was just two points below the cut line coming into Texas, but race leader Todd Gilliland ran out of gas, giving Haley the opportunity to go right on by to win and lock himself into the Championship 4. Haley’s Chances – He’s only got one start at Homestead, which came last year where he finished ninth after starting seventh. More importantly, it was a GMS entry. Haley finished ninth and 10th, respectively, in both stages. Final Analysis – Should Haley win the championship, it would be deserving for the rising star and helpful in his job search. During the post-race press conference following the ISM race, he said he doesn’t know where he’ll be and doesn’t have anything lined up currently for 2019. However, winning a championship could help his chances of landing a ride. Nonetheless, 2018 has been a consistent season for the Indiana native who has collected three wins, nine top fives and 17 top 10 finishes with 60 laps led. The championship win might just be his most important win yet.